1964.5 Mustangs: Information & Why It's Called a 1964 1/2 Mustang? Lee Iacocca, Ford’s then General Manager, commissioned his design team to come up with a two seated roadster that would compete with popular European cars as well as the American Chevy Corvette Sting Ray. A design team headed by assistant manager and engineer Donald Frey was formed and the new project was titled the “T-5”. After some consideration it was agreed that a cross breed roadster and Ford Falcon would be more suitable to modern demands. After all, the Ford Thunderbird, which was Ford’s most recent two seater car, did not fair as well as expected in current car markets. The T-5 was given a new design commission and Lee Iacocco gives much credit to the efforts of stylist David Ash for making the renamed “Mustang” a smashing success. In 1964 production was in high gear for the newly designed 1965 Ford Mustang. The highly anticipated Ford Mustang was honored by being named the Indianapolis pace car of 1964 and Ford stepped it up to accommodate the rising status of their new design. A special convertible version was adapted as the pacer. It was manufactured in white with a blue stripe on the hood and trunk. Ford also made 230 extra pace cars, available in convertible and hard top. The 64 1/2 convertibles had a 289cid engine, and the hardtops came with the less powerful 260 V-8. Thirty five convertibles were sold to dealerships and 195 hardtops were given out in dealer contests held in April of 1964. Clearly the new Ford Mustang was suddenly everywhere! It was even featured in 1964’s Bond movie, Goldfinger! Yes, the Mustang was an instant hit! A true royal gem in Ford’s car making history. It was the most successful release Ford had made since the 1928 introduction of the Model A and it has stood the test of time. Ford is still continuing the Mustang line and even the newer Mustangs are a modern collectors item. Although originally the Mustang was advertised as an early 1965 model, Ford made some changes to the later 1965 models that differentiated the two, and it is known today as the 1964 1/2 Mustang (1964.5 Mustang). Thus, the term 1964 1/2 or 1964.5 was eventually coined. What were some of the differences between the 1964 1/2 and 1965 Mustang versions? 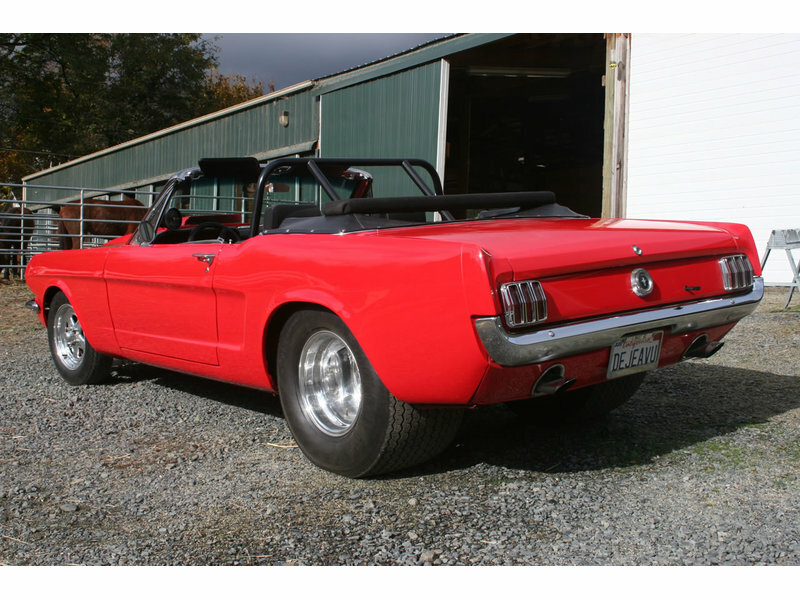 Read our 1965 Mustang page to find out! Curb wt-FB 2,606 lb. 1,182 kg. Curb wt-CP 2,556 lb. 1,159 kg.